Lay the face fabric out wrong side up. Clamp to the table along the bottom or use weights to hold the curtain in place. Position the lining, so the bottom of the lining is 2cm up from the bottom of the fabric. Pin in place just above hems. Trim the lining so it sits 5cm in from each side of the fabric (sometimes you may need to trim the fabric). Neaten the ends of the fabric hem by folding them up and under to form a mock mitre on the fabric corner. Ladder stitch along the mock mitre. Slip stitch the lining to the face fabric down each side and 10cm along the bottom of the lining at each corner. I think that your video is excellent. When it comes to sewing the lining onto the curtain fabric why do you hand sew it? Would it be ok to machine it? I have 4 2.25m length curtains to sew and am not much looking forward to all that hand stitching! We have shown hand sewn because that is the way we make them for customers in the workshop. There are other methods of making curtains and you can machine the lining and fabric together. It's called the bag method, you will need to make sure the lining is narrower than the fabric, place the fabric and lining right sides together and start your machine stitching from the bottom. In our experience it is just as quick and easy to hand stitch. What type and size of needle are you using to hand stitch? Especially when stitching the buckram in? Love your videos by the way. My first pair of curtains came out beautifully. We use a size 5 Long darner. 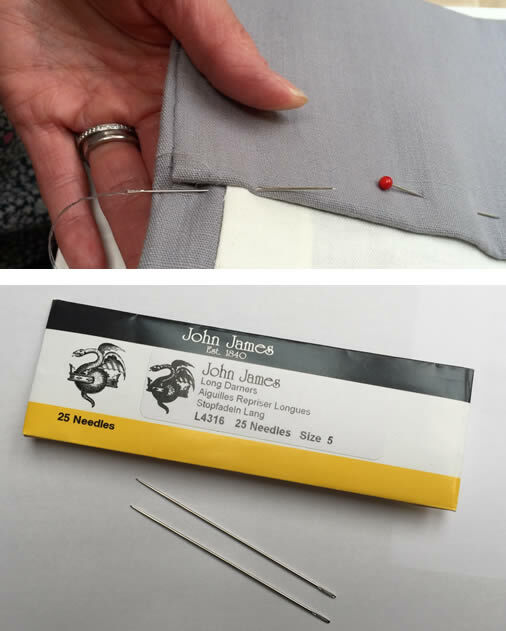 As a general dressmaker I really enjoyed reading your excellent comprehensive tutorials and wondered whether there is there any reason (other than aesthetic preference) as to why you don't loosely lock stitch the centre seams of the fabric and lining and secure the lining under a double fabric side seam so that they can be more quickly machined with blind hem stitch. There is more than one way of doing things. We don't lock stitch on a lined curtain only on an interlined curtain where we lock stitch every half width. As for the side seams andthe bottom hem we prefer hand stitching to bling hemming. The tutorial videos do demonstrate the differences between machining, blind hemming and hand stitching the hem. Machining is quicker but we think we get a better finish from hand stitching. Thank you very much - I am really enjoying working through this tutorial. Can you tell me if you have any plans to do a tutorial for interlined curtains? We are working on the interlined curtain tutorials now. keep an eye on our Facebook or Twitter for info on when they are on the website. Hi, thank you for your helpful tutorials. I have just finished making curtains which were two panels of a width and a half each, three metres in length. I am now on making bay window curtains which will need to be four widths wide, three metres in length. I feel as though this will be very difficult to manage and I am wondering if you would recommend making four panels, two widths each, or making the big panels, unlined, with a separate lining? It's a design decision. The look of the window would determine whether we made 2 four width curtains rather than 4 2 width curtains, not the fact that a four panel curtain is big to make. We do have a big table though and enough room to handle it. We wouldn't make separate linings and an unlined curtain for the same reasons. Really enjoying your tutorials. I wondered whether you can recommend a good website to buy your sewing accessories I.e. Clamps, set square, metre rule? When you fold in the selvedge side do you include the plain edge before the pattern starts in your calculation of 5cm or is it 5 cms of patterned fabric? Yes you include the plain edge. Can I ask why you dont sew the lining hem to the fabric panel for 10cm across the bottom each side and not all the way across? We dont, the hems should be very neat and tidy and making the way we do the lining and fabric can hang freely and independent of each other. With all fabrics (particularly natural ones) you can get some movement and shrinkage/expansion as temperature and humidity change. By letting them hang freely you wont get puckering if one moves more than the other. See our Blog item about shrinkage and you will see an extreme example of how the fabric can move. So, once the face fabric has 5cm turned in each side, the lining will be hemmed 2cm narrower and "gathered" eg.if laid flat once sewn the lining won't lie flat on the fabric? The lining is turned in and under 2cm at the sides making the lining panel narrower than the fabric panel. There is no gathering when laid flat.